First you plant your vine tomatoes, staked and spaced 50 cm apart… hang on… it’s too much Internet… this is about Chakalaka. Chakalaka is possibly one of the best known, simplest and most disagreed-on recipes to come out of South Africa. So lets straighten the score. Essentially a dish for the all-hours mine workers, Chakalaka was born in the mine compounds and townships. Miners and laborers could make this quick, cheap and easy dish to eat with their putupap (Stywe Pap). People will argue that it’s not derived from an ancient and noble African culture but Chakalaka can boast its origins in Johannesburg and Soweto and is truly a food of the people. At its most basic level, Chakalaka is a mixture of fried onions and tomato with some chilies added for vooma – get-go energy! Add some curry powder and you’ve got real heat! For more nutrition, tinned baked beans were often included in the mix. As the flavorful dish traveled further afield, spices and vegetables from the traditional Dutch, Malay and Indian cuisines found their way into the pot. Almost everyone will agree with the basic tomato-onion mixture but after that, all bets are off. Many cooks use the basic mixture as a starting point for a flavorful curry or vegetarian casserole but that becomes another story… This is the version shown to me in those first challenging years as a new wife living in the back-of-beyond. Fry onions slowly in oil, until they are rich brown color, add garlic and chillies. Stir through the curry powder, if using. Add the tomatoes, mix well and bring to a brisk simmer. At this point, reduce the heat and cook until the tomatoes are mushy and have formed a thick sauce; about ten to fifteen minutes. Stir every few minutes and if the liquid cooks away, add enough water to keep the mixture gravy-like. Adjust the seasoning and serve with putupap (Stywe Pap) or rice or pasta or couscous or… Over time, many cooks have *improved* the original; here are some other ingredients that can be added (but not necessarily all together). With summer threatening the northern hemisphere, some of you may be growing your own tomatoes. After the pizza and pasta sauce, consider using the rest of your tomato glut in this handy dish. It’s quick and easy and, with the addition of some leftovers, dinner can be ready in a flash. Did I mention Chakalaka is also very good for you? No home-grown tomatoes? No problem. 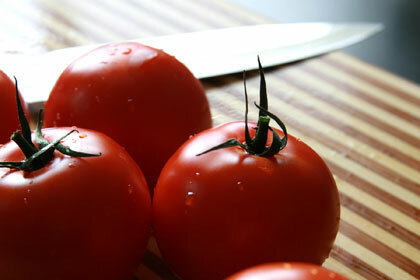 Head over to your nearest farm stall or farmers market and get a bunch of vine-ripened tomatoes. Maximum flavour, maximum goodness, African style…nom, nom!